A fortress/fortified town in the north of the Czech Republic, originally dating from the late 18th century, but known mostly for its use as a Gestapo prison, Jewish ghetto and concentration camp during the German Nazis' occupation of Czechoslovakia in WWII. 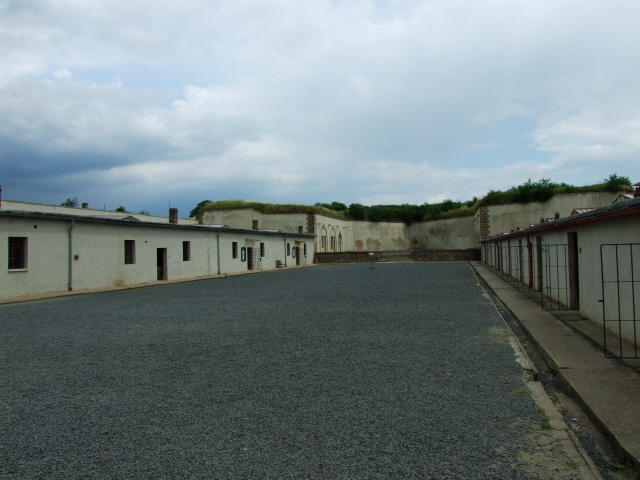 More background info: Theresienstadt, or Terezin in Czech, is divided into two parts, a large fortress, primarily a military barracks complex and later used as the ghetto, and the "small fortress", the prison proper. The prison complex has been a memorial site since shortly after the end of World War II, and the Czech Republic's prime site of this kind. In more recent years, further memorial sites, mostly within the actual town, the large fortress, have been added. 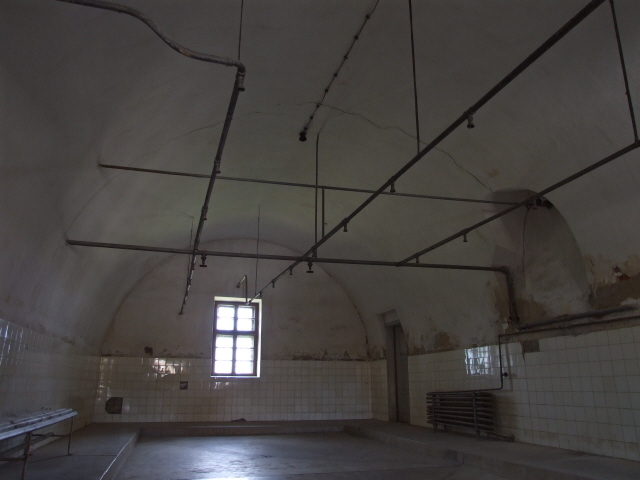 From the beginning, prominent inmates were kept here, including the assassin of Archduke Franz Ferdinand (whose murder is generally considered the decisive spark that triggered World War One – cf. Sarajevo and Military History Museum, Vienna). The main notoriety of Theresienstadt stems from the Nazi era, though. Soon after the Nazi invasion of Czech lands, the existing fortress and military prison were taken over by the Gestapo in 1940 as a central prison for incarcerating political prisoners, resistance fighters and all manner of otherwise "undesirable" individuals, mostly Czechs but also other nationalities. As could be expected, the prison was soon overcrowded and living conditions became horrendous. Some 2,500 died here either from disease and torture or were executed. The ghetto set up by the Nazis in the town of Theresienstadt, however, was of at least the same historical significance. In fact, it is rather the ghetto that earned the place the designation concentration camp – although the terminological distinction is still somewhat controversial. Whatever the terms used, it is clear that Theresienstadt played an exceptional role in the whole system of the Nazi Holocaust. This is mainly due to the Nazis' decision to choose Theresienstadt as a "model camp": the enforced pretence of orderly, hygienic and culturally enriched "normal" life" did indeed succeed in concealing the real truth of the Holocaust from the Red Cross inspectors who came to visit the camp. For this purpose the Nazis also shot a propagandistic "documentary" film about the camp, which showed life in Theresienstadt from a rose-tinted perspective. 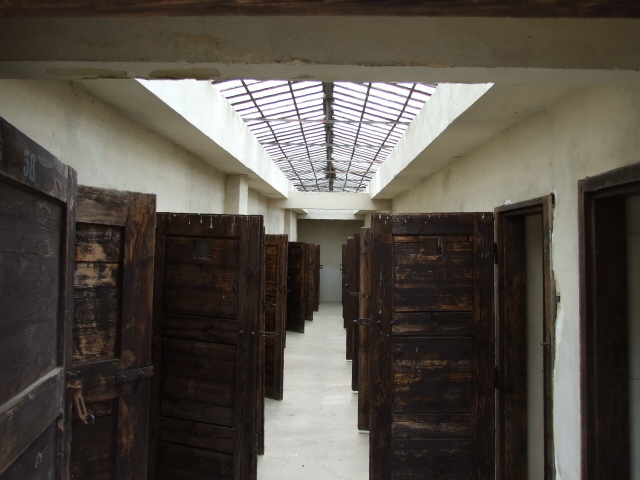 The cynicism of the Nazis was taken to another level when, as part of the ploy to deceive the inspectors, a contingent of Theresienstadt's inmates were sent to a "family camp" specially set up within the complex of Auschwitz, with the aim of having them write letters home to those left behind in Theresienstadt, letters in which they had to report that all was well. Like so many others, however, they later ended up in the gas chambers too, once the inspections were over. 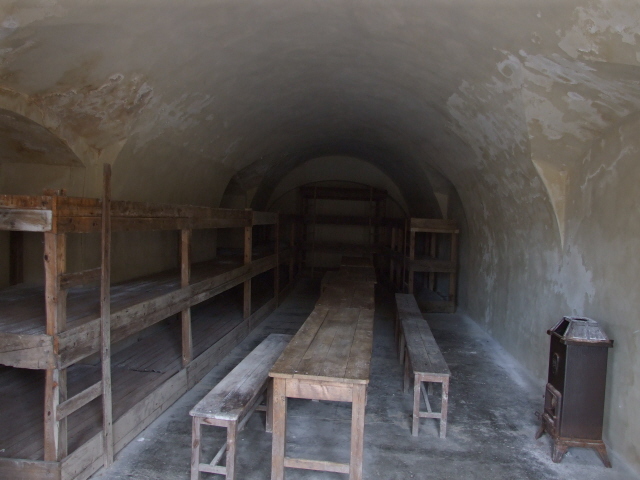 Theresienstadt's primary function was to serve as a 'transit camp'. Some 150,000 (almost exclusively Jews) passed through the camp – most went on to be deported to the death camps in Poland, especially Auschwitz, Treblinka, Majdanek and Sobibor. Only 4,000 survived. 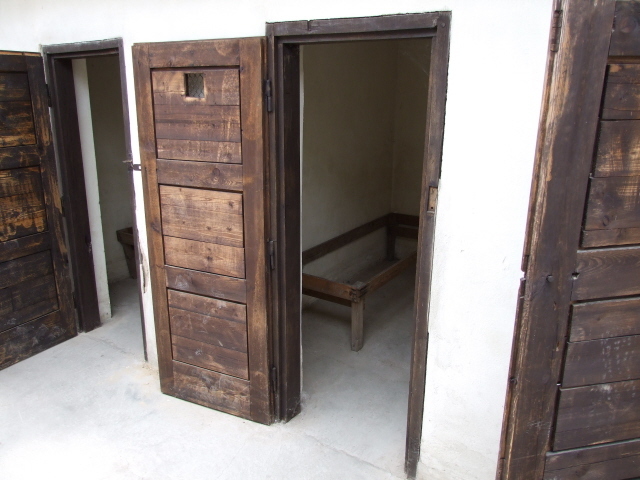 Even in Theresienstadt itself, some 35,000 victims perished. 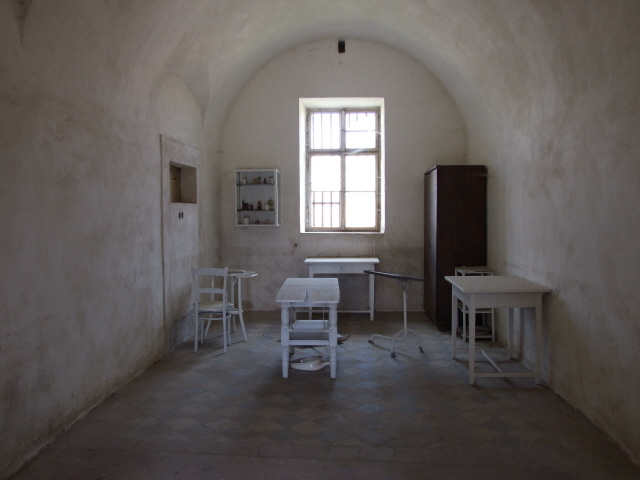 After the liberation of the camp and the end of the war, the "Small Fortress" briefly served as a prison for Germans before being converted into a memorial site in 1947-48. As so often in the former Eastern Bloc, the fact that the vast majority of victims were Jews wasn't exactly spelt out clearly (more emphasis was placed on the memorial to communist resistance fighters – cf. also Sachsenhausen), but this has gradually been put right, esp. since the end of the Cold War and the fall of the Eastern Bloc communist regimes. Today there are a number of further memorials, including in particular the Ghetto Museum on the town square of Theresienstadt, the former Magdeburg Barracks and the crematoria on the outskirts of the town. 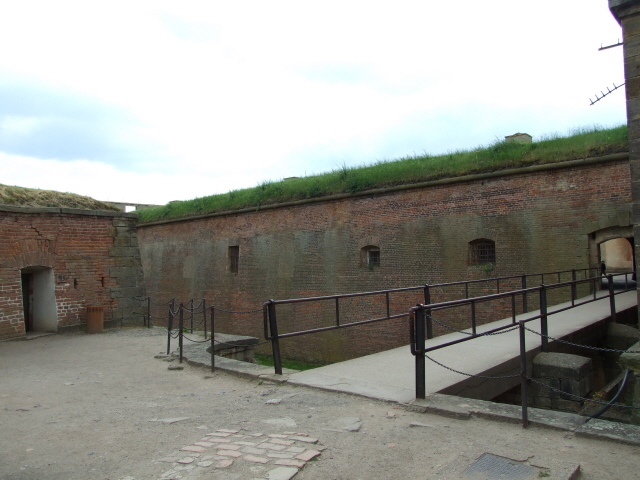 What there is to see: The main port of call for visitors is still the memorial of the "Small Fortress", i.e. the former prison. The official self-guided circuit first takes you to former administrative buildings, partly still with original furniture, and to the first courtyard with the prisoners' cells. 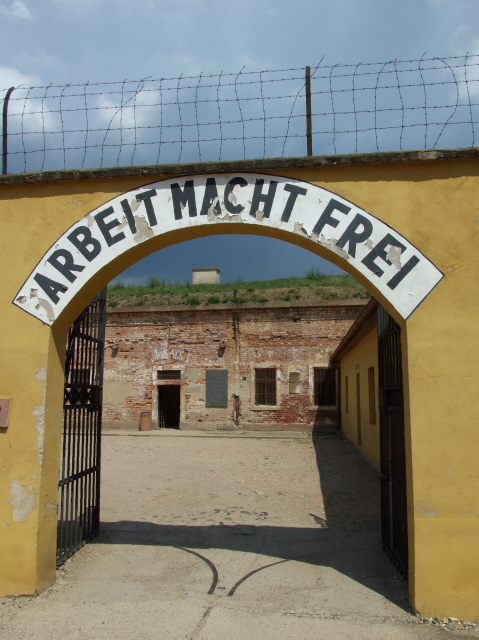 Over the gate to the courtyard the infamous line "Arbeit macht frei" ('works makes free' or 'work brings liberty') is written – which is unusual for a prison (it is more typically found at the gates of proper labour and concentration camps such as Auschwitz 1 or Sachsenhausen). Bathrooms and medical stations can also be seen. 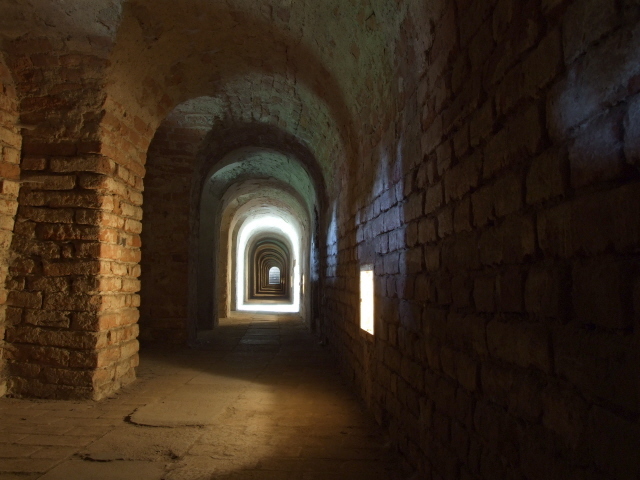 Then the path leads into a long corridor set within the brickwork of the fortifications – it's 500m long and pretty narrow, so not for the claustrophobic. Coming out at the other end you emerge into an outer yard which served as the execution grounds. 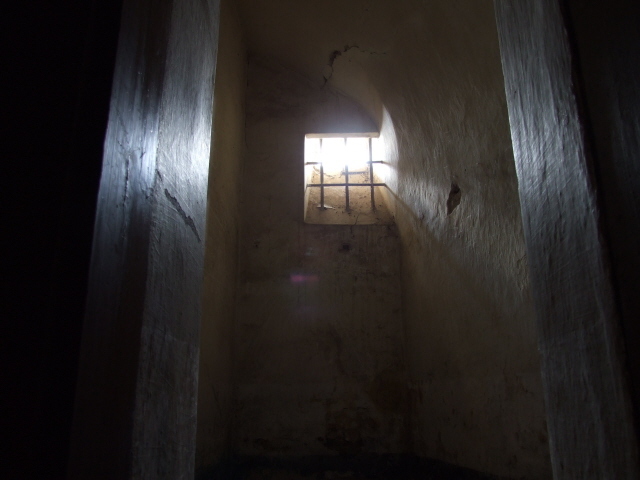 These usually took the form of shootings – the gallows still standing here were put to use only once, to set an example after a failed escape attempt. Back inside the fortress one building houses the cinema that had been set up for the prison guards, and in which today a film about the camp is shown to visitors. On demand this is also shown on a plasma screen in the adjacent anteroom. Further on, another gate leads into the fourth courtyard, which only entered service in 1944. More blocks of prisoners' cells are to be seen here, both mass cells and solitary confinement cells. Three rooms contain special exhibitions (although at the time of my last visit in June 2008, two of these were not accessible). The former SS barracks building set in the main central square houses a more comprehensive museum. Further more recent exhibitions are devoted to the former concentration camp in nearby Litomerice (which mostly consisted of underground tunnels which themselves are no longer accessible to the public). Back at the main entrance there's a little on-site souvenir shop. Outside the entrance lies the cemetery where the remains of victims were buried after the war. Near the fortress walls a large Star of David rises over the graves. At the other end of the cemetery a huge wooden cross has more recently been added – which understandably created some outrage amongst the Jewish community. The main car park near the memorial is the most visibly commercialized part of the place – with several fast-food and drinks stands as well as further souvenir stalls. From here it's a roughly half a mile walk to the main fortress, i.e. the town of Terezin proper. On its main square the former school building now houses the Ghetto Museum (opened in 1991). Its exhibition depicts life (and death) in the Jewish ghetto – placing a certain emphasis on the children, who formed a significant proportion of the ghetto's inhabitants. It has to be noted as well, that in Theresienstadt quite a stunning range of art had been created by artists, including not only accomplished adults' works but also a few rather impressive and touching drawings made by far younger hands. Another exhibition about life in the ghetto is housed in the former Magdeburg Barracks in the south-east of the town complex. South of the main fortress, the former crematoria have also been turned into a memorial, as have the mortuary and funeral rooms. Furthermore, there's a small memorial at the site where the Nazis disposed of cremated victims' ashes in the river. This can be reached by following the signs from where the main street between the two fortresses crosses the river. 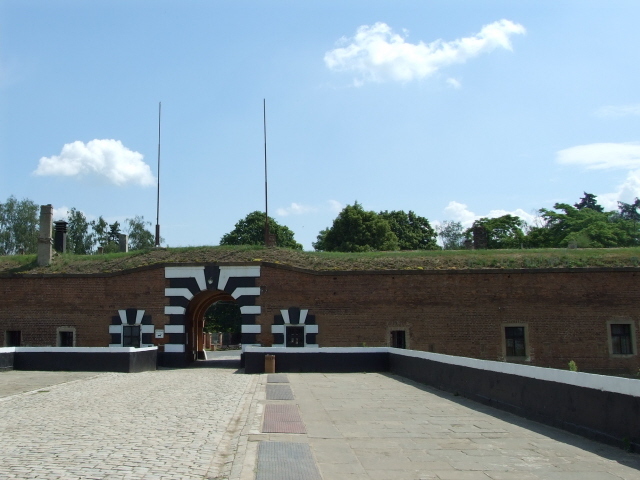 The town of Terezin, apart from its memorials and museums, exudes a strange, almost eerily lifeless empty atmosphere, despite some rather pretty park-like squares and renovated baroque buildings. This and the well-kept grounds of the "Small Fortress" can blur the fact that, while nowhere near as sinister as in places like Auschwitz-Birkenau, living in the prison or camp of Theresienstadt was no picnic either. What is also a bit of an annoying distraction is the degree of commercialization – starting with the admission fees (see below). On the other hand, the "educational value" of the site has certainly been increased significantly since my first visit here back in the early 1980s (then as part of a school trip – like the ones still frequently encountered here). Location: Theresienstadt, or Terezin in Czech, is in the north-west of the Czech Republic, some 30 miles (50 km) north of Prague, near the town of Litomerice. Access and costs: a bit awkward to get to (other than by car or organized tour), and not cheap for a place like this. 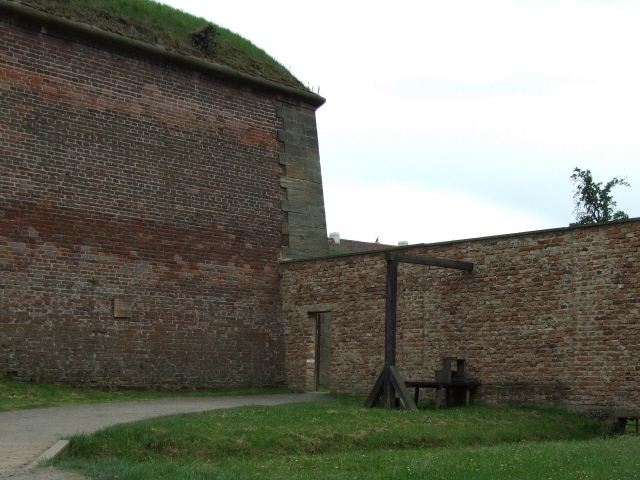 Details: the easiest option is to visit Terezin as a day trip from Prague. There are buses going here from Prague's bus station at Florenc (taking approx. one hour). Trains are not a good option, as Terezin isn't on a train line and doesn't have a station of its own, so you'd need to go to the next town and walk or find a transfer over. For individuals it's probably most convenient to get here by their own means of transport – which also gives them the freedom to keep away from the large tour groups. The typical group dynamics of such parties can, as so often in places like this, be detrimental to the experience of the visit. 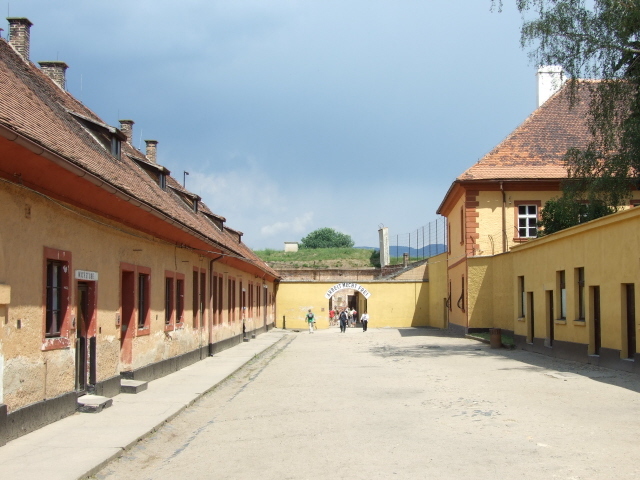 There is limited accommodation in Terezin – if staying in this otherwise somewhat dull place appeals at all – and more options in nearby Litomerice. Admission to the memorial site of the "Small Fortress" costs a comparatively handsome 170 CZK (whereas most sites of this type are generally free in neighbouring Germany and Poland), a combination ticket including the Ghetto Museum and the former Magdeburg Barracks is 210 CZK. Guides, however, do not charge extra (but have to be booked in advance) – but then again, it's perfectly possible to do the tour of the site on one's own. You can also get guided full-day trips from Prague – which is the luxury variant of a visit to Terezin, as it were. An additional fee is now levied for a photography permit: 50 CZK per camera. Opening times of the Small Fortress are: daily 8 a.m. to 6 p.m. (only 4.30 p.m. in winter), the Ghetto Museum and Magdeburg Barracks are open daily 9 a.m. to 5.30 p.m., the former crematoria daily except Saturdays (!) from 10 a.m. to 6 p.m. (winter to 4 p.m.). Time required: The guided tours are estimated at 90 minutes – which seems a bit rushed. It is easy for the interested visitor to spend well over two hours here, esp. if you want to read everything that's displayed on the text panels in the exhibitions in detail. In that case a visit can last up to four hours. The Ghetto Museum and Magdeburg Barracks require less time. (I did the former in about 30 minutes; but then again I didn't read all the text panels as much of it was already familiar to me – which generally determines how long you spend in places like these.) Another 30 minutes or so each will have to be allocated to visiting the other memorials. All in all, it can be a full day's excursion programme from Prague. Combinations with other dark destinations: One could try to trace the remains of the former forced labour camp at Litomerice (to the west of the town), but there isn't much to see there. More rewarding is a visit to memorial at Lidice, the site of a village razed to the ground (and its inhabitants killed or deported) by the Nazis in the wave of brutal reprisals following the assassination of Reinhard Heydrich in 1942. The memorial site is another worthwhile day-trip option from Prague as the most suitable base. Combining a visit with Theresianstadt in the same day is not feasible. Otherwise Prague itself and the day excursion from there to Kutna Hora's Sedlec ossuary are the obvious other destinations in the area. Combinations with non-dark destinations: Not much in the immediate vicinity, although some of the little towns in these parts have a certain charm of their own (Litomerice being the closest). Otherwise, again, see under Prague.